Mercury itself has been an innovator in the nautical industry for decades. Their outboard motors are designed to function in a wide variety of settings, offer a diverse power range, and are tested hard to ensure the product is robust enough to withstand corrosion. Learn more about what this brand brings to the table and why their outboards deserve a second look by reading below. Mercury’s commitment to efficiency shines through in every outboard they make. They’re helping to lead a charge that’s revolutionizing the entire boat engine industry. Even engine classes that are traditionally considered loud and inefficient are shattering stereotypes thanks to superior design and production. These feats of mechanical engineering will take you further on every tank of gas. Mercury’s design and engineering team are among the best in the world. They’re constantly pushing the boundaries of what people thought was possible from outboard motors. Even with low weights and efficient fuel ratings, Mercury’s products are able to produce impressive amounts of performance and power. Their diverse lineup of products spans a wide range of horsepower so you can power just about any boat. Generating power is only part of a motor’s job. The driver also needs to be able to direct that power easily to ensure a safe and enjoyable boating experience. Mercury creates engines that are light and easy to maneuver, so your power will all be directed exactly where you want it to go. These outboards will make your boat more fun to drive and make the experience safer for everyone involved. Steer confidently at any speed, and know that you’ll be able to direct your boat precisely on the water. To find a reliable Mercury outboard motor for your vessel, visit us at Nautical Ventures. 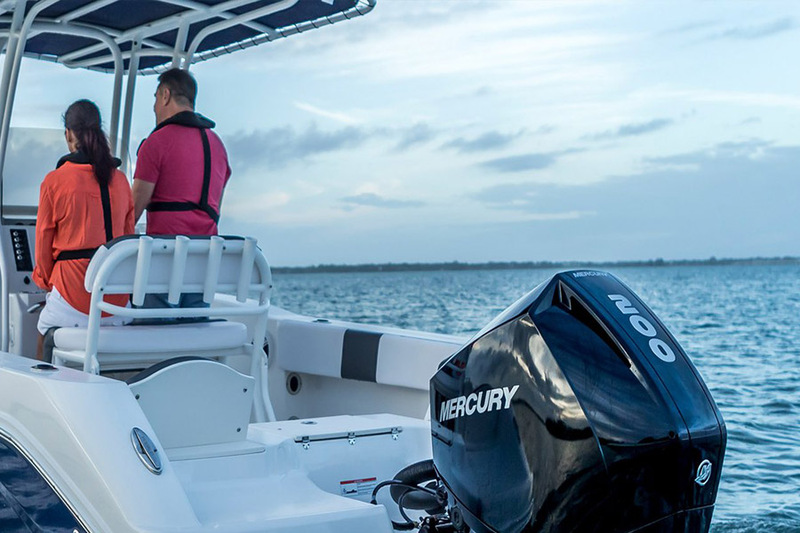 We’re a trusted dealer of Mercury outboards because the brand has recognized us as well-equipped to sell the high-quality motors they produce. Our status as a Mercury outboard vendor in good standing gives our customers the full protection offered by Mercury’s warranty. Learn more about the Mercury outboards we offer, then come visit us to see the lineup for yourself.